ETH researchers are using the CRISPR-Cas system to develop a novel recording mechanism: The snippets of DNA it produces can provide information about certain cellular processes. In the future, this cellular memory might even be used in diagnostics. Events such as infections by viruses, as well as the exposure to environmental toxins or other forms of stress, change the activity of genes, thereby leaving molecular traces inside the cell. These changes happen mainly at the level of messenger RNA (mRNA). These are molecules that encode genetic information when genes become activated and read, a process known as transcription. Researchers can accurately investigate the activity of a gene by measuring the mRNA molecules present in a cell. However, the traces of gene transcription disappear rapidly—mRNA is highly unstable, and cells often degrade it after a short time. ETH researcher Randall Platt and his colleagues in the Department of Biosystems Science and Engineering have now developed a molecular recording system that writes transcriptional events into DNA, where they can be permanently stored and later accessed to by sequencing. To create their "recording device," Platt's doctoral students Florian Schmidt and Mariia Cherepkova employed the CRISPR-Cas system. CRIPSR-Cas is an adaptive immune system in bacteria and archaea. The system functions like an immunological memory device by recording genetic information about pathogens infecting the cell. This genetic information is recorded in a specific stretch of DNA known as a CRISPR array—a process called acquisition. CRISPR arrays are capable of storing short sequences of DNA, known as "spacers" originating from a pathogen. Spacers are separated from each other by short, identical DNA sequences called direct repeats, just like pearls on a string. The researchers worked with the gut bacterium Escherichia coli, introducing the genes for the CRISPR-Cas system from a different bacterial species. 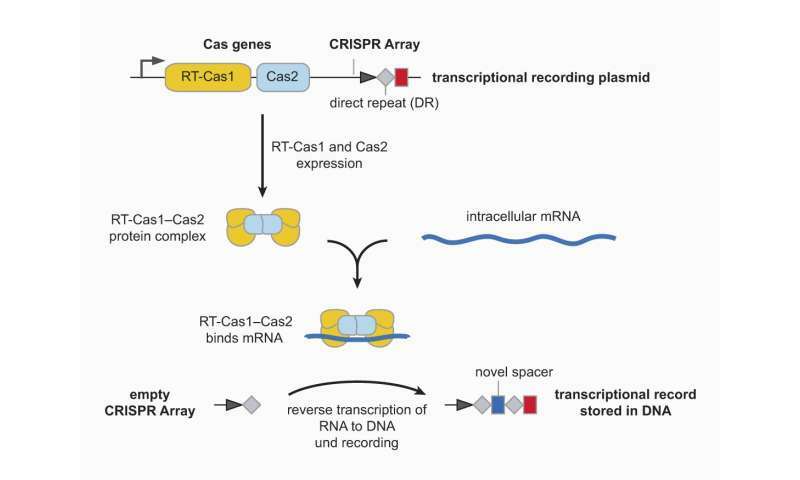 One of those Cas genes is fused to a reverse transcriptase, an enzyme that uses an RNA molecule to produce DNA encoding the same information—in other words, it transcribes RNA back into DNA. The Escherichia coli cells supplied with the foreign genes for this CRISPR-Cas were able to produce a protein complex that binds short mRNA molecules. The reverse transcriptase translates these RNA spacers into DNA, containing the same information as the original RNA, and subsequently storing them in the CRISPR array. This process can occur multiple times such that new spacers are added to the CRISPR array in reverse chronological order, so the most recently acquired piece of DNA is always first. In principle, this makes it possible to record any number spacers within a CRISPR array. Since DNA is highly stable, the recorded information is stored for a long time and is also passed on from one generation of bacteria to the next. "Our system is a biological data logger. It records the genetic response of bacteria to external influences and enables us to access that information, even after many bacterial generations," says Florian Schmidt, the lead author of the study, which was recently published in the journal Nature. ETH Professor Randall Platt says, "Researchers have been working on creating forms of synthetic cellular memory for a long time, but we are the first to develop one that can record information about the expression of each gene in a cell over time." The researchers have spent over two years working on this system. Until now, researchers were limited to measuring mRNA at only a single snapshot in time. Taking these snapshots generally means destroying the cell, extracting its mRNA, and then quantifying them. In contrast, the new CRISPR-Cas RNA recording system records the history of cell, allowing researchers to access the entire cellular log book rather than just a single point in time. As part of their study, the ETH researchers recorded the reaction of E. coli bacteria equipped with the data logger to the herbicide paraquat. This substance provokes changes in mRNA transcription within the cells, and the scientists could read out this response from the CRISPR arrays even days after the herbicide exposure. Without the data logger, any molecular traces of the bacteria's contact with the herbicide would have long since been broken down and the information lost. Such biological data loggers, in addition to being interesting for research purposes, could also conceivably be used in diagnostics or as sensors to measure environmental toxins such as herbicides. The present study demonstrates the feasibility of such an approach, although practical applications are still a long way off. Randall Platt's research team in Basel is already working on transferring the system to other cell types and paving the way for its effective use as a diagnostic tool.